On Monday, Feb. 29, the Supreme Court denied certiorari, or the right to review the appeal against the jurisdiction of the U.S. Environmental Protection Agency to impose pollution limits set forth in the Chesapeake Bay Clean Water Blueprint. The primary appellants were the American Farm Bureau Federation and the National Association of Homebuilders. Conservationists rejoice and opponents are disappointed, but I hope this doesn’t discourage an ongoing collaboration and discussion about how all Chesapeake Bay residents and various business interests can come together in the name of preserving our beloved landmark. A cooperative discussion did take place, however, on Feb. 25 in Washington College’s Decker Theatre, entitled, “Can Food Production and a Clean Chesapeake Bay Coexist?” Panelists addressed environmental concerns and agriculture in the watershed. Seven organizations, including conservationists and farmers, were present. They didn’t aim to answer the gathering’s theme question, but hoped that it would create a dialogue that would continue into the future. “Even though it’s not perfect, the food system we have here and the collaboration between farmers and conservationists is pretty unique to the entire country,” Trey Hill of Harborview Farm said. The agricultural industry has primarily adhered to the regulations set forth in the Chesapeake Bay Blueprint and the overall consensus is that this legislation is needed and beneficial for the overall health of the Bay. To better understand the objection to the blueprint, it is important to examine its basic structure and foundation, found in the law and the associated regulatory framework. Federal environmental regulations are generated from the principle of “cooperative federalism,” through which things like normal pollution standards and interstate commerce are set by the federal government and regulated by the states. Since the Bay is a multi-state watershed, the EPA has long endeavored to address farm runoff. Fertilizer and manure runoff are some of the largest sources of pollutants in the Bay. The EPA has established and set Total Daily Maximum Load Limits (TDML’s) across various industries and 92 segments of the Bay. As we’ve discussed in previous articles, 60 percent of the measures set forth in the blueprint are to be in place by the next year and full measures exercised by 2025. The appellants argued that the EPA shouldn’t have the jurisdiction to go into such detail in limiting the TMDL set and the states should have more authority in that measure. The courts upheld that the blueprint was an example of cooperative federalism, in which states and the EPA worked out a detailed plan to address pollution runoff and those TDML’s are part of such a cooperative effort. The main issue doesn’t appear to be that opponents aren’t concerned about clean water or caring for the Bay, but that it is a costly plan to uphold and that the brunt of it falls on the agricultural industry. 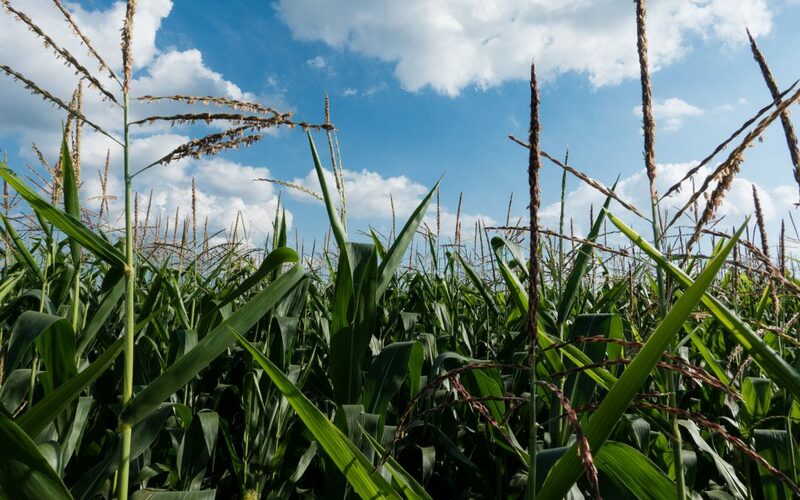 Maryland estimates that the plan will cost $13.3 billion by the 2025 deadline, and Virginia estimates the costs as high as $15.7 billion, including removing 500,000 acres of farmland from production. Some counties will suffer greater casualties than others if their arable land is close to waterways that drain into the Chesapeake — like a lot of our farmland in Maryland. 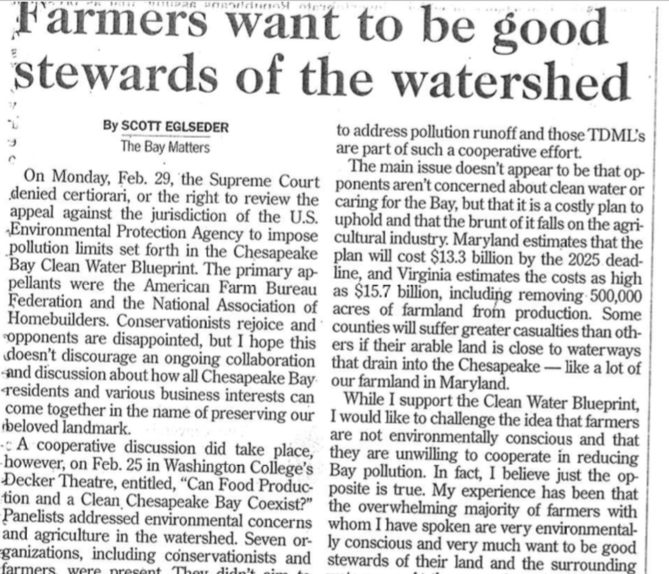 While I support the Clean Water Blueprint, I would like to challenge the idea that farmers are not environmentally conscious and that they are unwilling to cooperate in reducing Bay pollution. In fact, I believe just the opposite is true. My experience has been that the overwhelming majority of farmers with whom I have spoken are very environmentally conscious and very much want to be good stewards of their land and the surrounding waterways. At the same time, they must not only operate their businesses, they must do so profitably. Of necessity, we all consume agriculture products. We all eat. As a result, all of us have a very direct interest in these issues. Most of us would like to see the health of the Bay continue to improve as we move into the future. At the same time, we have to recognize that in order to remain profitable and stay in business, our farmers may have to pass along to us many of the increased costs of compliance — if they can — resulting in higher food prices. We must also be aware that our farmers have national and global competition. If the cost to our farmers of being compliant is too high, farmers in other parts of the country — or world — may be able to provide us with the same food and agriculture products that we need at a lower price, which could put our local farmers out of business. I believe that improving the health of the Bay is not an “us against them” issue. We need to work together and have a thorough understanding of the complexities involved, especially when a specific sector or industry has to face regulations that cost money to implement and maintain. I believe that there is no problem without a solution. Sometimes you just have to work very hard to find it. The Oyster Reef Recovery Initiative has started to send out letters encouraging Talbot County residents to sign up to grow an oyster garden. Visit www.oystersforthebay.com to get involved! • March 19, Lawn Fertilizer Workshop. Learn how you can use less fertilizer and still have a beautiful lawn. 10-11:30 a.m. Queen Anne’s County Library, Centreville. • April 2, Project Clean Stream at various locations throughout the Midshore. Be a part of one of the largest Bay cleanup events. 9 a.m. to noon. Various locations.